Happy Memorial Day! I feel like I should be posting a flag cake or something more patriotic, but the truth is all I really wanted to eat this weekend was biscotti. Well, and brownies; but the brownies didn’t turn out very well. Luckily, this almond biscotti worked out very well. I added apricots to make it Apricot Almond Biscotti. I may make these again with dried cranberries. 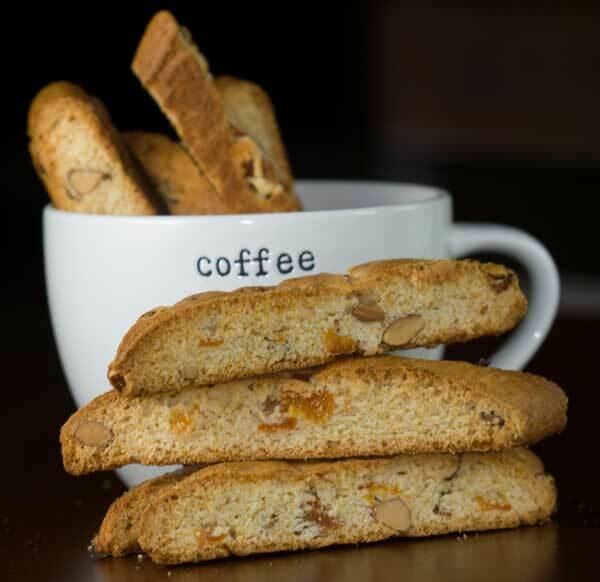 An easy biscotti recipe made with apricots and almonds. Preheat oven to 375 degrees F. Line a large (12x17 inch) rimmed baking sheet with parchment paper. Chop the apricots into small pieces and set aside. In a large mixing bowl, vigorously whisk the eggs until foamy. Add brown and granulated sugar and whisk for about 30 seconds, then whisk in the oil and both extracts. Whisk in the salt and baking powder, making sure they don’t clump. With a large spoon or heavy duty scraper, stir in the flour until a sticky dough forms. Stir in the apricots and almonds (and white chips, if using). Empty the dough onto the parchment lined baking sheet. With damp hands, form dough into two 8x3 ½ inch rectangles about ½ inch thick. They should be side-by-side on the baking sheet, but space them about 5 inches apart so they'll have room to spread. Bake on center rack for 25 minutes. Cool rectangles on baking sheet on a rack 10 minutes. Loosen rectangle from baking sheet with a metal spatula and carefully transfer to a cutting board. Reduce oven heat to 325 degrees F.
Slice rectangles with a non-serrated knife spacing about a half inch between each cut. You should get about 13 pieces per rectangle. Arrange biscotti, cut side down, on baking sheet and bake 10 minutes on each side, or until pale golden. Transfer biscotti to rack and cool. **If you weigh your flour, you don’t have to worry about stirring and aerating before measuring. I made these this weekend with apricots and cranberries and they were delicious! Gone in two days. I’ll be making another batch this week, with less sugar as we’re not big on sweets. Thanks for the recipe! perfect…have dried apricots…must make these soon! Happy Memorial Day. How about making these with dried cranberries & blueberries. Then you’d have something patriotic!